The amount of information available about social media marketing online is both a gift and a curse. It’s great to have resources you can look to for tips and information for being successful on any social media platform. The downside is that sometimes having all of that content thrown at you from all angles can be overwhelming. With hundreds of different blogs dedicated to the topic of social media marketing, how do you know which ones to follow? In an ideal world, we’d have all the time we needed to sift through hundreds of blog posts each day but the reality is that’s not possible. We’ve taken the guess work out for you by compiling a list of the top 10 social media blogs that will teach you everything you need to know about social media marketing. Whether you’re a complete novice looking for the basics, or an experienced social media manager that just wants to stay on top of the latest trends and news, you’ll get value from following any of these blogs. It’s nearly impossible to talk about the top social media blogs without referencing Rebekah Radice. Radice is a social media strategist, author, speaker and an award-winning blogger. Her blog is ideal for people who want to go beyond the basic “why you should use Twitter” type of content. Radice’s blog really dives into the “how” of social media marketing and shows you how to take a strategic approach to your campaigns. Instagram is red hot right now, and Jenn Herman’s blog is an amazing resource for small businesses or bloggers that are looking to make the most of the visually driven app. Herman is respected as an expert in Instagram marketing and uses her blog to share insider tips and tricks. One of the best aspects of her blog is the case studies. Here she dissects different Instagram accounts and highlights why they’re successful. Not only does she tell you what works, but she also explains how you can apply the same strategies to your own business. Some marketers may have jumped ship on Pinterest to head to Instagram, but consumers haven’t followed. Pinterest hit the social media world like a brick in the face and although the buzz has died down a little bit, it’s still a very powerful social network. 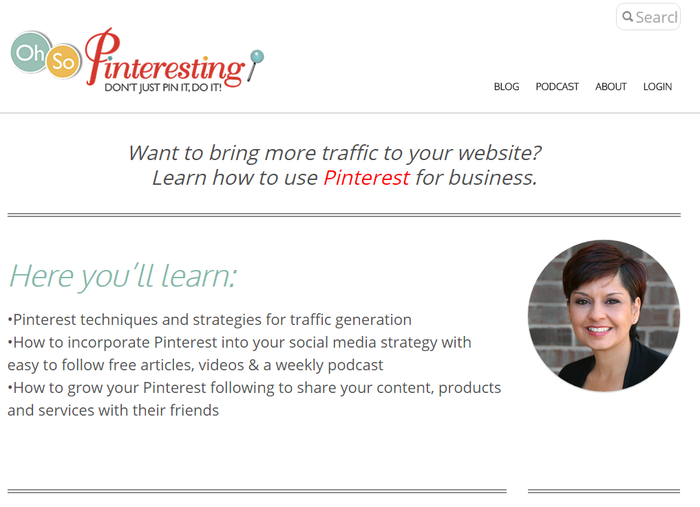 Oh So Pinteresting is a blog by Cynthia Sanchez that gives helpful insights into being successful on Pinterest. Originally her blog started out with just written articles but she also added a podcast. For retail stores, e-commerce sites or anyone selling physical products, you’ll definitely want to put this blog on your must read list. 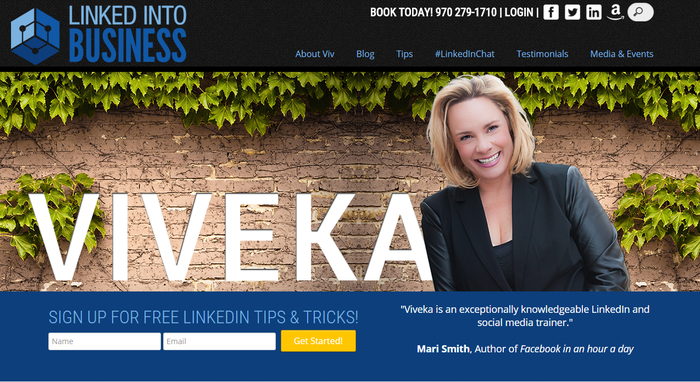 Created by Viveka von Rosen, Linked Into Business focuses on the world’s largest social network for professionals, LinkedIn. Rosen is a pro when it comes to growing your business with LinkedIn and uses her blog to openly share her knowledge. She also features guest bloggers occasionally which provides you with even more expert advice. If you want to go beyond the blog, she hosts a weekly #LinkedInChat on Twitter every Tuesday at 8 p.m. EST. Peg Fitzpatrick is an all around social media pro. She worked with the social media guru Guy Kawasaki to create one of the top social media marketing books available, “The Art of Social Media.” Thanks to her vast experience, Fitzpatrick’s able to give tips on a variety of social platforms which makes it a great blog no matter what social network you’re using. One of the things that differentiates her blog from other social media marketing blogs—besides her experience—is her posts that help you get the right mindset necessary to be successful. Because sometimes you just need a little motivation. Brian Solis is a digital analyst and he dedicates a large chunk of his efforts to studying trends. Instead of focusing on what’s hot right now, Solis offers insight into where things are heading in the future. When it comes to social media marketing, it’s crucial that you have some type of vision for the future because social networks don’t stay around forever. On his blog, you won’t find the “popular” topics like how to get more Twitter followers. Instead, you’ll find content that makes you re-think the way you approach social media marketing and your business in general. Dynamic. Unpredictable. Genius. Those are the three words we’d use to describe Gary Vaynerchuk. If you’re unfamiliar with his speeches, videos or content, it’ll only take you a few minutes of browsing his site to see why he’s become so well known in the digital marketing world. Vaynerchuk’s direct approach cuts through some of the fluff and misconceptions that you might have about social media marketing. On his blog, you’ll find a mix of videos and articles about what it takes to succeed on social media. Curated Content: Time Saver, or Dangerous Proposition? 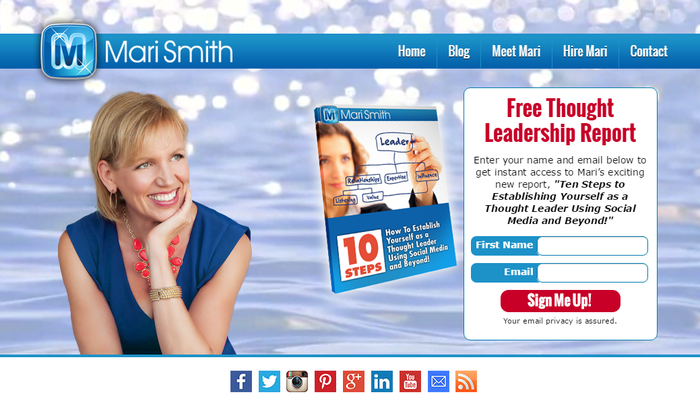 If you want to learn more about marketing on Facebook, then Mari Smith’s blog is the place to be. The “Queen of Facebook,” Smith curates posts about social media marketing with the core focus being Facebook. In addition to the topics you’d expect to see, like how to grow a following on the social network, she also shares content on more meaty subjects like how to find paying customers or running successful Facebook Ad campaigns. 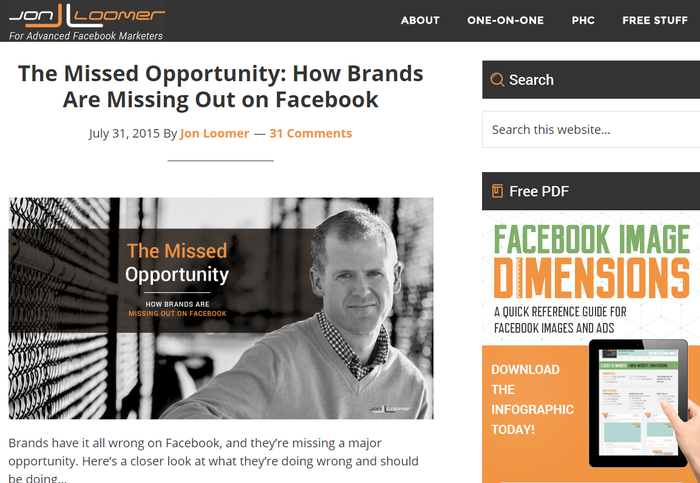 Jon Loomer’s blog is another great resource for Facebook marketers. Loomer uses his 5+ years of experience in Facebook marketing to give actionable tips to help you grow your brand and business through the largest social network to date. The great thing about his site is that he gives plenty of real world examples instead of just theories. Social media is often referred to as the great equalizer that allows small businesses to compete with the big guys. 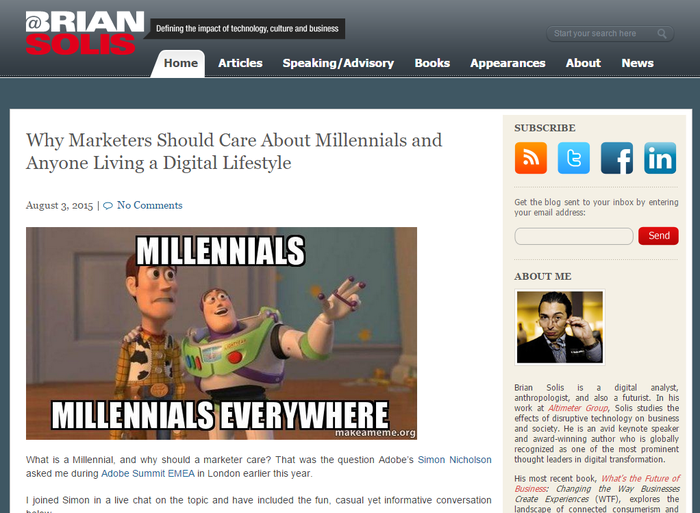 Kim Garst’s Boom Social blog focuses on just that. Garst shows small businesses how to use social media marketing to gain new customers. The fact that her blog emphasizes social selling is what puts it ahead of other blogs. Growing a following on Periscope is great. But if it’s not giving you a return on your investment then does it really matter? That’s where Garst comes in to take you from point A to point B. This list could keep going for days. 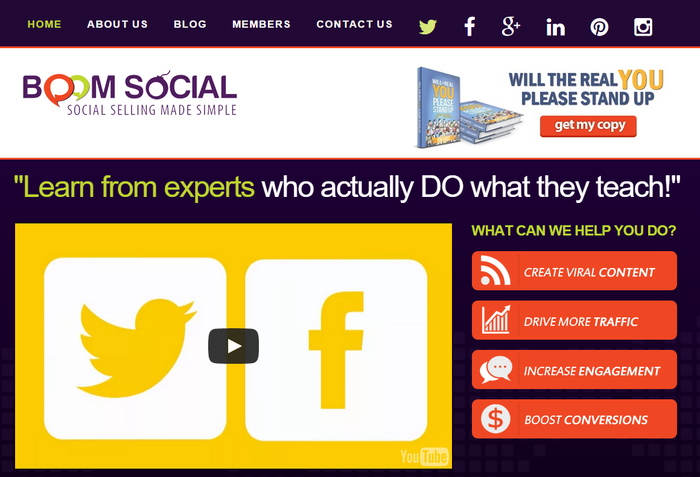 There are a lot of other great social media blogs out there worth checking out. With the 10 blogs we’ve mentioned, you’ll be able to start putting together a strong social media strategy and implement it like the pros. Of course, you can always read through Sprout Insights too! Want to learn more about other aspects of digital marketing like content marketing, PPC or SEO? Here’s 55 more digital marketing experts you should check out.